This Sunday is Father’s Day and that means my husband’s favorite pie. I thought you might like to try it for your Father’s Day celebration or picnic. Have a wonderful weekend and Happy Father’s Day to all of the terrific Dads out there and to those wonderful people who represent Dad to so many who love them. Before you start: Preheat oven to 400° spray pie dish with cooking spray. Let’s Make It! Place tapioca in a spice or coffee grinder; process until finely ground. Combine tapioca, cherries, sugar, lemon, almond extract and salt in a large bowl, combine well. Let cherry mixture stand 30 minutes; stir to coat well. Roll 1 (9-inch) dough portion into an 11-inch circle. Fit dough into pie dish coated , allowing dough to extend over edge of plate. Spoon cherry mixture and any remaining liquid into dough. Roll remaining (9-inch) dough portion into a 12-inch circle. Cut dough into 12 (1-inch-wide) strips; arrange in a lattice pattern over cherry mixture. Fold edges under; crimp with the back of a fork. and sprinkle dough evenly with 2 tablespoons turbinado sugar. Loosely cover edges of pie-crust with foil, and bake an additional 40 minutes or until crust is golden brown and filling is thick and bubbly. Cool pie in pan for 45 minutes on a wire rack. Yummy it's making my mouth water already. Thanks for sharing. Wish I was a bigger fan of pie, although I might like this one. Sounds and looks scrumptious, but what in the world is turbinado sugar? This pie looks divine! I spotted it on my sidebar and couldn't resist coming over. Thanks for sharing! Mmm cherry pie is my favorite!! 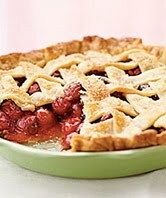 my husband would probably faint from happiness if I ever made that pie.. May give it a try sometime looks delicious! Looks delicious. Will try it some time. Prefer chicken pie though. This looks so good! My dad would add eight scoops of ice cream and be set. I hope your husband enjoys this and had a nice father's day. Love, love pies! Especially with all types of berries.